With the exception of the advent of guns and steel, the popularity and success of the UFC has had more effect on the influence and evolution of martial arts than anything in human history. In no other time has this much reevaluation of the method and purpose of martial arts taken place, both in the minds of participants and on-lookers. One of the major paradigm shifts made since the first eight UFCs is the acceptance of wrestling as a martial art. Today, wrestling is arguably considered by most fighters and trainers as the single most important discipline to master before fighting in mixed martial arts. It wasn’t always so. Before the UFC, when most people thought of martial arts they imagined people in pajamas, yelling as they spin-kicked boards into smithereens. They imagined mystical old monks who could defeat foes much younger than themselves or self-defense techniques that could turn anyone into a holy terror, all of which came from mysterious lands east of Greece. No one, or at least no one in popular culture, viewed their high school wrestling coach as a martial arts master. No, if you really wanted to learn how to fight you had to pay Tiger Pak $100 a month, for him to teach you forms, one step sparring, board breaking and the splits. Wrestling was not for fighting. The first three UFCs proved that Gracie jiu jitsu was “the best”. But let’s not forget that the finalists in the first three UFCs were strikers: Gerard Gordeau, Pat Smith and Harold Howard all got to the finals by knocking people out with strikes. So while UFC 1, 2 and 3 proved that Gracie jiu jitsu works, it didn't permanently cement the idea that grappling—much less wrestling—was the most important skill set for a fighter to have. It only proved that Gracie jiu jitsu was great. That was until UFC 4 and 5, when Dan Severn became to wrestling what Royce Gracie was to Brazilian jiu jitsu. Dan Severn (101-19-7) was a former US Olympic wrestling team alternate before he ever knew what a triangle choke was. His first fight in the UFC was against a much smaller kickboxer, Anthony Macias. I remember the first time I saw Dan Severn using suplexes in an actual fight. At the time, I was a freshman in high school who had earlier quit the wrestling team, simply because it was too hard. My best friend at the time, Jamar Wallace, was still on the wrestling team and watched the UFC with me. We were freaking out, as the same moves taught to us by Coach Pierre were being used effectively on martial artists. “Two on one! Saturday Night,” we yelled, calling out the wrestling moves we recognized as they were performed. This inspired me to go out for wrestling again, my sophomore year, and finish the season; not because I liked the sport (I never really did) but because I wanted to learn how to fight like Royce Gracie and Dan Severn. Wrestling instantaneously became a martial art for me that night and I know I can’t possibly be the only one who had that same experience. Dan Severn lost in the finals to Royce Gracie but won the following tournament, UFC 5. He also won the Ultimate Ultimate, a tournament of UFC champions and runner-ups. His strategy was simple, take his opponents down and then beat them with his knees, elbows and hands. Dan Severn also used sprawl and brawl to his advantage, in the Detroit Dance, one of the fights that inspired the current rules that force fighters to engage. Dan Severn kept the fight standing against Ken Shamrock, essentially using his wrestling in reverse. In Shamrock’s defense, the bout’s rules officially made striking with a closed fist illegal but wasn’t enforced. Shamrock, it is said, intentionally chose to submit to this handicap and fight with open handed strikes, pancrase style. Severn used open fingered gloves and punched. Severn would then go on to fight Mark Coleman for the first official UFC heavyweight championship and lose, thus effectively passing the torch. 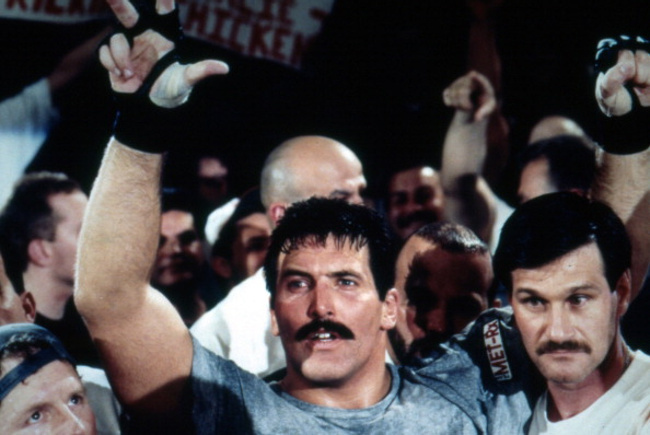 Mark Coleman is credited with being the father of “ground and pound,” and while he was arguably the first to coin the term and most effectively use it, Dan Severn did it first. Who can watch what Dan Severn did to Tank Abbot during the Ultimate Ultimate, or earlier yet, what he did to Oleg Taktarov in UFC 5 and not say that was the beginning of wrestling based ground and pound. Granted, the same strategy was employed by Wallid Ishmael against Eugenio Tadeu in Desafio but Dan Severn’s use of what would later be called ground and pound paved the way for Coleman, Kerr, Erickson, Hughes, Tito and every other wrestler who would then go on to dominate the sport. Dan Severn is to wrestling what Royce Gracie is to Brazilian jiu jitsu: he won respect for his martial art and paved the way for further paradigm shifts in fighting because of it.